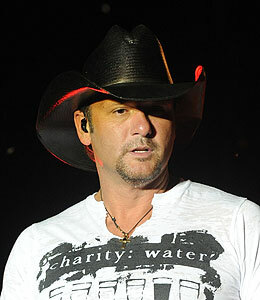 Country singer Tim McGraw has no tolerance for violence -- so he booted a rowdy fan out of a recent show! Tim tells "Extra" that he noticed a reportedly drunk and abusive man in the audience getting rough with a woman. "He was putting her in headlock," Tim explains. "I have three daughters and certainly couldn't respect myself if I sat back and watched something like that happen." Southern gentleman McGraw is currently touring the country in a series of sold-out shows. His new album, "Southern Voice," hits stores October 20.